Two-time Academy Award-nominated director Bruce Beresford (DRIVING MISS DAISY, MAO'S LAST DANCER) showcases a brilliant performance from two-time Academy Award-winner Jane Fonda in PEACE, LOVE AND MISUNDERSTANDING. For uptight Manhattan lawyer Diane (Oscar-nominee Catherine Keener), crazy means driving her teenage son Jake (Nat Wolff) and daughter Zoe (Elizabeth Olsen) to Woodstock to visit their grandmother Grace (Fonda). The crazy part is that the kids have never met Grace. In fact, Diane hasn't spoken to her mother in twenty years. Grace is the epitome of the term "hippie": she stages protests and hootenannies in the town square, smokes (and sells) a lot of dope, and howls at the moon once a month with her goddess-worshipping girlfriends. But what's meant to be a weekend getaway turns into a summer adventure of romance, music, family secrets, and self-discovery. 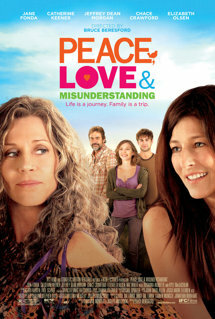 PEACE, LOVE AND MISUNDERSTANDING is a heartfelt comedy and a story about second chances and the things that divide and reunite families.